The warmer temperatures of spring are always a welcomed sign after a long winter and can only mean one thing: time to once again enjoy the outdoors. But this does not just include bike rides or lounging by the pool, but the entertaining of friends and family outdoors. 1). Candles: Candles have a way of romancing any setting by the light dancing around the table. Be sure to have various heights of candles and holders to ensure a beautiful tablescape. Tea lights are a great way to highlight place cards while keeping candles low to ensure uninterrupted eye contact and conversation. Keep in mind that unscented candles are best when dining as to be sure not to detract from the delicious meal prepared. 2) Fresh Flowers: Why purchase flowers from a florist when you can take directly from your garden. Your garden will gladly tell you what items are currently in bloom—be sure to listen to your garden. 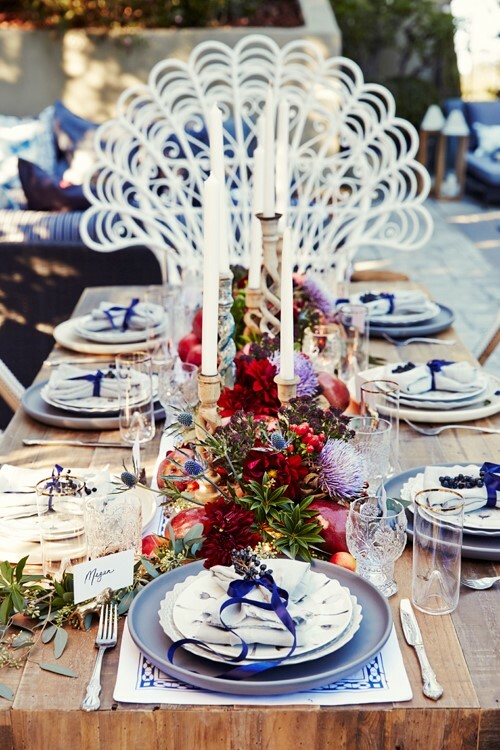 Look for opportunities to support a theme or color story around the table, as well as including flowers and herbs from the garden in dishes and drinks. 3) Theme: Spring and summer offer a wide variety of themes around color, texture, woodlands to seascapes. Find a theme and look for ways to layer visual texture. One way this is possible is to pick a color and find shade variances of the color to use in tablecloths, to creative “placemats,” to stemware and flatware. 4) Lighting: Dining outside often means the pesky, outdoor flood lights being turned on so everyone can see. But opt for something more creative. Dust off the old dining room chandelier stored in the garage or find one at a second hand store that you can wire and hang in a tree above the table. With a small detail like this, the guests will be wowed and a fun mood set for the evening. On summer evenings, be sure to hang high enough to light the space but more importantly to keep insects away from the table. For a really fun look—layer multiple chandeliers at various heights and styles. 5) Seating: Don’t be afraid to mix up 2 or 3 different seating styles. The biggest factor that leads hosts astray is not using similar seat height and scale. If using picnic bench seating—trying pulling some thinner pillows from inside that the guests may sit on or use to prop themselves up. 6) Linens and Textiles: Look for ways to wow your guests with textiles such as the linens you use for napkins. Another fun way to welcome your guests is to hang drapery panels from the trees, make a canopy of fabric or hang other objects of interests from the trees above with your guests seated below. If the seating isn’t the most comfortable—toss on some colorful, outdoor pillows that can be used to support the back or even sit on for more comfort on a less than pleasant chair or bench. Your guests will appreciate the added touches of comfort! 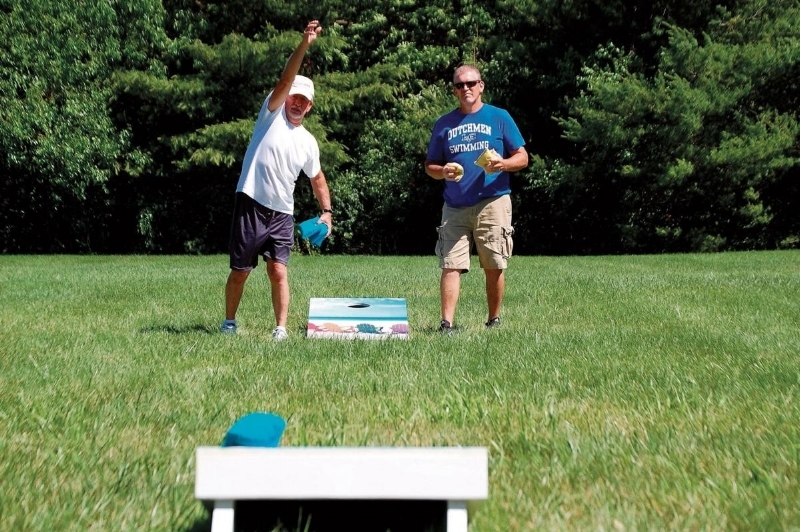 7) Garden Games: As the host, you may pulled away from entertaining to refresh drinks or prepare the meal. Find creative ways for guests to entertain themselves so you can step away practically unnoticed. Interesting games such as life-size chess pieces or checkers can be fun and can be created by using pavers to create the board. Not willing to invest in life-size chest pieces? No worries—opt for making a tic-tac-toe board. Don’t be afraid to use the unattractive fence between you and the neighbor as a place to project old movies to support a theme. 8) Outdoor dining lends itself to more relaxed serving options such as buffets. The buffet can be a great way to reinforce the theme through accessories, while allowing you to have your guests serve themselves. Look for ways to do something larger here to state the “theme,” for example a larger floral arrangement, which would be difficult to use on the table where conversation is to take place. 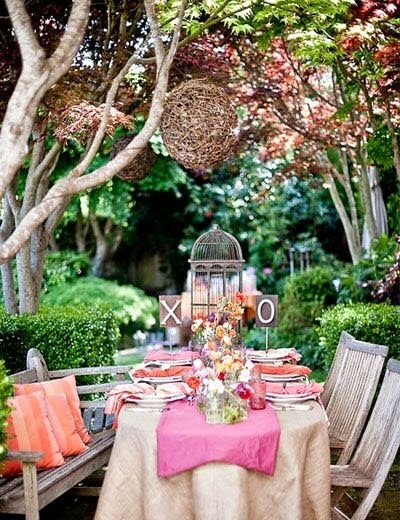 Whatever the occasion may be for your al fresco dining experience, most importantly, be sure to enjoy and have fun. It’s the memories created with our loved ones that make the experience the most remarkable.